Home productivity	5 Steps to Make Sure You Sign that Prospect! 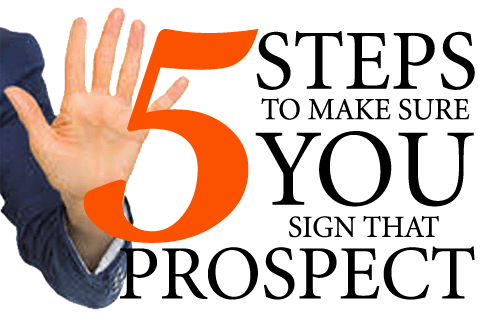 5 Steps to Make Sure You Sign that Prospect! When it comes to pursuing a prospect, keep in mind it’s all about quality rather than quantity. If they aren’t the right fit, they won’t convert into a good close. It’s all about building relationships; but, make sure it isn’t based on you wanting this more for them than they want it for themselves. Follow these steps to know that you’ll sign the right prospects for your product, service, or opportunity. Be diligent in your follow up efforts. Follow up is key. As soon as you get a person’s name and number you need to follow up immediately and no later than 24 hours. You want them to remember you and following up consistently will help ensure that they do. Your persistence and consistency will also help solidify that when they do join you you’ll be there for them, a key to longevity in your business. Don’t accept their first ‘NO’. ‘No’ is your prospect’s way of saying “I need more information.” Ask questions about their ‘no’. Give them the information to give them every reason to say ‘yes’ and find questions to ask that they can say yes to. This will help them realize that joining you is a good decision. Don’t assume their interest level. People have a knack for putting on their “poker face” when money is on the line. They don’t want to show any genuine excitement when going into a presentation, especially a business presentation because their guard is up. They want to feel empowered to make their own decision on something you both know is good for them, but are afraid that if they show interest that you will manipulate them. Don’t be discouraged, most people are skeptical in the beginning; but, asking plenty of questions to find a solution to their problem will help them feel at ease. So, don’t shut the door on them, and don’t stop or change your presentation based on what you ‘think’ they’re thinking. Be confident in yourself and your opportunity. Remember, you’re the messenger, not the message. The message needs to stay the same no matter what signals your prospect is giving you. Don’t over exaggerate your opportunity or product. Remember, your company already has a name for themselves, and a product. In the recruiting process what you’re selling is YOU. If you over exaggerate any one of these things (product, opportunity, yourself) they will see you as a phony. I can’t emphasize enough how you need to be realistic about your company, the income, the effort, and what to expect going in. You are your prospect’s counsel and your truth will help lay a foundation of trust that will strengthen your relationship in your business. In the end, the decision to say ‘yes’ to your opportunity is up to your prospect. 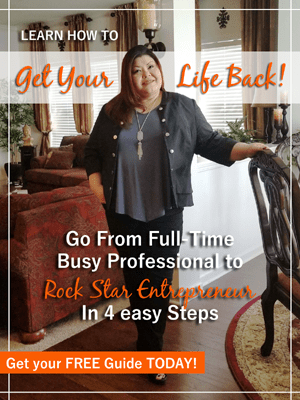 But, with these five steps you can give yourself and your prospect the best shot at engaging with you in a business that could be life changing. Keep in mind that if you have followed all these steps and they still do not sign up, they may not be a qualified prospect in the first place. They may not be the right person you’re looking for, or this may not be the right opportunity or business for them. Either way, at least you will know that you’ve done everything possible for them to make the best decision for themselves and an opportunity to create a well-thy lifestyle.